We had the pleasure of attending a New York City screening of Kedi, a documentary that follows the lives of Istanbul street cats. The film gives a closer look at nine distinctly particular cats, with their own personalities and temperaments. 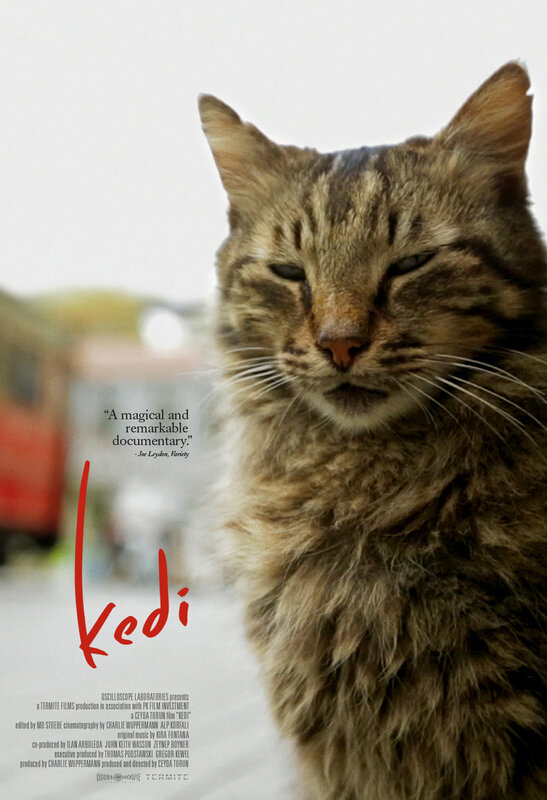 A fascinating study on man and nature, Kedi weaves the two together in a touching study on the human condition. 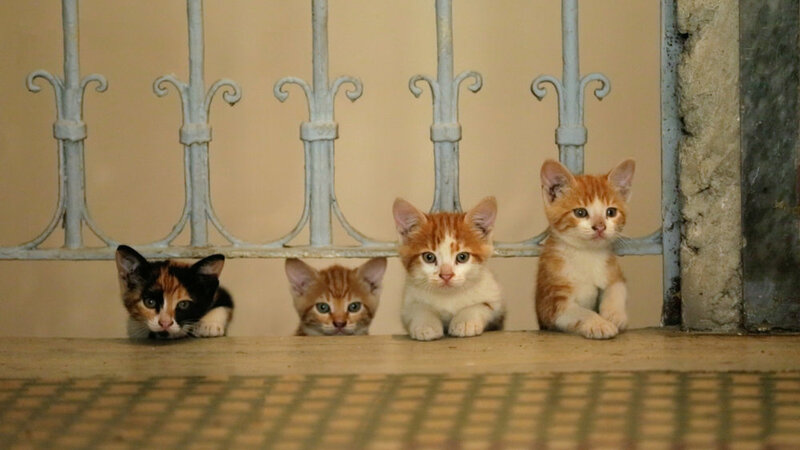 The movie opens on a white and orange cat roaming the streets of Istanbul - she's on a mission to find food for her new litter of kittens. The cat's name is Sari and the woman who keeps an eye on her whereabouts - the closest thing she has to an owner - says that before she gave birth, she never used to be so proactive; she'd just sit around and sleep all day. Sari is just one of the hundreds of thousands of cats who inhabit Istanbul, and these cats are neither feral nor tame. They enjoy head scratches and then disappear into the street, only to return when they wish to solicit food scraps or the loving hand of a human. The movie centers on nine cats with distinct personalities. With names like, "Psikopat" ("Psycho" in Turkish); "Gamsiz" ("Carefree"), and "Aslan Parçasi" which loosely translates to "Part Lion," these cats are clearly individuals and the human subjects often compare their personalities to those of people. At the particular screening we attended, we enjoyed a Q&A session with Ceyda Torun, the Turkish-born director who wanted to portray the special human to cat bond that she grew up with. One of the audience questions dealt with the cat as having significance to the Muslim religion, and the audience member wondered if the prevalence of cats in Istanbul had something to do with that. Torun answered that Istanbul is the only city like it (versus all Muslim-majority cities), and she speculates that the ancient nature of the city had a hand at play. She gave an anecdote about ancient archaeological findings where the skeletal remains of a cat had been unearthed, and the leg was broken and re-set in a way that suggested a human had bandaged the cat's leg - and that was 3,500 years ago. So the cat/human bond clearly goes back so far that it's simply a way of life for many Istanbulites. 'Kedi' is shot in an engaging visual manner, with the camera panning low to the ground, mimicking a cat's POV, and others shot wide above the city, illuminating the breathtaking ancient city views from a bird's eye view, as well as emphasizing the beauty of the symbiotic relationship between man and cat. Throughout the documentary, Torun cuts from vignettes about our nine cats to stories of the humans who care for them. You'll meet the cat lovers of Istanbul who shelter and feed the cats including shop keepers, sailors, and artists (during the Q&A, Torun made note that an unusually high number of artisans [versus other occupations] took on caregiving roles for the cats). One woman cooks 20 pounds of chicken each morning, and goes out into the city to leave spoonfuls of food for the cats. Another man said that a few years ago he suffered a nervous breakdown - he couldn't laugh or talk. After he started taking care of the cats, he regained his joy for life and credits the cats with saving his life. Catch the trailer below, and check screening dates here. Showings are on a limited basis through February and March 2017, so don't miss it!